A hipster trap by Jeff Greenspan and Hunter Fine. Photo by Hunter Fine. One day in March of 2011, Jeff Greenspan and Hunter Fine set out to catch a hipster. They had built a trap out of cardboard, but it looked like a bear trap. 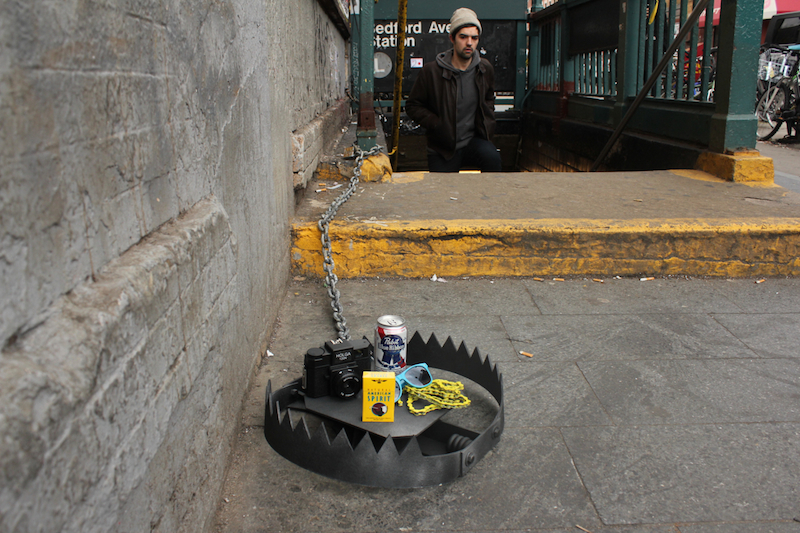 They chained the trap to a sign in New York City, loaded it up with a few hipster essentials (a can of PBR, a yellow bike chain, a pair of wayfarer sunglasses, and a pack of Natural American Spirit cigarettes), and got ready to wait. But before they could get in position to watch their trap somewhat slyly, a man approached the pair and asked if the trap was theirs and if it was “a hipster trap.” Fine and Greenspan were excited that someone immediately identified their trap as exactly what they had intended it to be and explained that they put it up but now it belonged to the street. Then, the man took a quick photo and they all exchanged contact information. Later that same day, the man got back in touch with Greenspan and Fine to say that his photo was picking up traction on reddit. Will Simon, aka gigaface on reddit, had set things in motion for the hipster traps to go viral. The story had made it onto reddit’s front page and the photo has subsequently gotten over 1 million hits on Imgur. Soon, major media outlets like The Village Voice, Gothamist, and Time were picking up the story too. The hipster traps (and subsequent variations like the Tea Party trap which were collectively termed Urban Traps) were pretty temporary works. The traps held real items with real monetary value. At least one hipster trap even included a Holga camera. Those items probably weren’t going to last too long on the street. Sometimes, if Greenspan and Fine noticed that a trap wasn’t getting much attention, they picked it up and moved it somewhere else. One thing that Greenspan thinks the internet has done for street art is to make it permanent. Cardboard hipster traps are pretty ephemeral on the street, but a photograph online is (more or less) forever. It’s not that these traps weren’t meant to or couldn’t be enjoyed by people seeing them on the street, but the number of people who saw them in person is greatly overshadowed by the number who saw a photo or two online. For Greenspan, this leads to the question of whether or not the hipster traps should even be considered street art, since they were consumed primarily online. But by that standard, most street art wouldn’t be considered street art. Greenspan also notes that the risk/reward ratio for projects like the hipster traps is way out of whack compared to the risk/reward ratio of street art and graffiti before the internet. Most of the time Greenspan and Fine were installing the traps, Greenspan didn’t think they were taking as big a risk as a street artist putting up a wheatpaste or spraying a stencil, and it was the very first trap they installed that made the project world-famous. Shepard Fairey had to put up Andre the Giant and OBEY Giant work prolifically for years to get noticed in the same way without the internet to help him. Hipster traps are one example of how street artists can take minimal risk and not repeat themselves at all and still get massive amounts of attention. This idea seems to make Greenspan a bit uncomfortable because it means he’s being called a street artist when he’s done these low-risk projects. He doesn’t consider himself a street artist, and he has respect for the street artists have made their names getting up again and again and taking more significant risks to get their work in front of people. While Greenspan and Fine weren’t going to keep the traps to themselves and they did want to tell people about them, in this case it was an outsider who got the ball rolling. As Greenspan sees it, reddit alerted mainstream media to the story and proved that it was interesting, so they picked it up. Simon’s photograph and a bit of luck with his reddit submission resulted in millions of people hearing about hipster traps, far more than could have heard about them or seen them if they were made before the internet and social media were so prevalent.